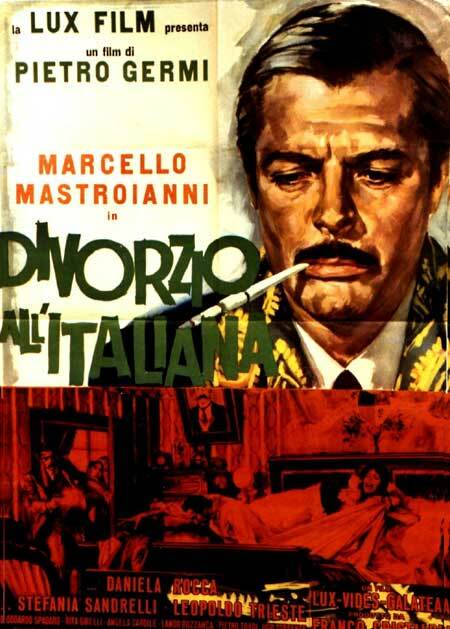 DIVORZIO ALL'ITALIANA (DIVORCE, ITALIAN STYLE: 1961), awarded an Oscar in 1963 for the best original story and script (written by Ennio De Concini, Alfredo Giannetti and the director himself), takes Germi back to Sicily, not however the Sicily of the mafia but rather of the high land-owning aristocracy. Since at that time divorce didn't exist in Italy and local society would not have tolerated cohabitation, Baron Fefe, in order to marry his enticing little cousin, Angela, must first of all get rid of his wife. At first, he fondles various kinds of perfect crimes in his imagination, then as an expert connoisseur of the rigid moralistic mentality of his world, gets the idea for a highly unique "Italian-style divorce": force his wife to commit adultery, catch her redhanded and then he would be authorized, according to a certain article of the penal code, at that time still in force, to kill her "for reasons of honor". To be sure, he would spend a few years in prison, with all the comforts a rich man could afford, but thanks to "good conduct" he would soon be released and able to wed the charming Angela. The story unfolds, agile and amusing, linking together minor and major figures, people and geographical and social backgrounds. Marcello Mastroianni is an utterly absurd Fefe, indolent, sly, bored, without a job or a serious worry in the world, the prototype of an impoverished and effete aristocracy which Germi eyes with the maliciousness of great satire, just as the arm of satire serves him to attack those aspects of the penal code which to the modern conscience seemed more than out-of-date. Moral outrage was the mainspring of the director's second comedy of manners set in Sicily: SEDOTTA E ABBANDONATA (SEDUCED AND ABANDONED: 1964), written by Germi with Luchino Vincenzoni, Age and Scarpelli and centered entirely around the agitated figure of Vincenzo Ascalone, the father of family who even on his death bed is obsessed with defending the "family honor". A much more mature work than the previous one, with characters more deeply explored, developments more complex, it is to be considered one of the most successful products of Italian-style comedy and of Germi as a director, starring an actor who up to that moment had been relegated to secondary character roles, Saro Uzi, and Stefania Sandrelli, an actress whom Germi discovered and rightly supported: her aggressive and exuberant Agnese confirms the qualities that emerged in the Angela of her first film, DIVORZIO ALL'ITALIANA (DIVORCE, ITALIAN STYLE).